Anybody who watches a lot of vintage movies knows that they often prove fascinating simply as time capsules, independent of whatever’s happening in terms of character, story, or theme. That effect is so pronounced, in fact, that I’d much rather sit through some random mediocrity from 1938 or 1972 than endure any of today’s failed studio product… even as today’s failed studio product immediately begins its long, slow journey to becoming tomorrow’s source of inadvertent allure. If nothing else, you learn—well, not what life was like at that time, necessarily, but at least how audiences of the day wanted to see themselves, or how various filmmakers thought they did. Every once in a while, though, something even more remarkable happens: A movie made years ago seems for all the world to be commenting on or anticipating some contemporary phenomenon. Often this amounts to little more than plus ça change, plus c’est la même chose, but it can be fairly bracing nevertheless. For example, I recently re-watched Todd Haynes’ phenomenal Safe, which came out in 1995, and I was amused to see that Julianne Moore’s climactic birthday speech, in which she anxiously fumbles her way through an incoherent series of shopworn self-improvement buzz-phrases, plays exactly like Sarah Palin’s notorious interview with Katie Couric. That moment was a bit too brief to share in this column, but take a look at this scene from Nicholas Ray’s Bigger Than Life (1956) and see if you can guess which current personality sprang into my head. Watch the clip first; I’ll provide the context afterward this time. So now we know: Glenn Beck suffers from cortisone-inflicted psychosis! 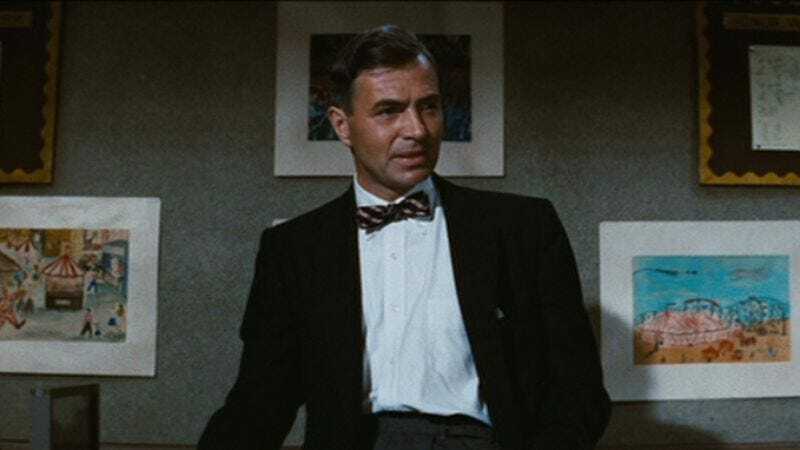 Bigger Than Life was inspired by a New Yorker article about the dangers of that then-revolutionary drug, and observes schoolteacher James Mason as he gradually becomes more and more unhinged under its influence, to the point where he winds up advancing on his own son with a pair of scissors. Here, about halfway through the film, we get our first real sense of how deranged he’s become, but I couldn’t help thinking that you can hear stuff exactly like this on Fox every night of the week. Granted, I’m one of those elitist coast-hugging liberals, and I haven’t actually watched much of Beck’s program; no doubt his fans will quickly inform me of the many ways in which his own message of retrograde conservatism differs from Mason’s. Still, a demagogue is a demagogue. Even if the words aren’t precisely the same, the wrathful tone seems eerily familiar. Now, I know what you’re thinking: Just how long am I gonna ignore Walter Matthau’s jacket? Yes, we also now know where Pretty In Pink’s Duckie got all his wardrobe ideas. This was Matthau’s third feature film, and it’s interesting to see how Hollywood perceived him early in his career: nattily dressed, sensitive, the generic best pal. And the opening of this scene, which finds the not-yet-irascible Matthau standing at the entrance like the scholastic equivalent of a Wal-Mart greeter, does offer one of those eye-opening time-capsule moments I mentioned, as he and that other dude (who only appears in this one shot, I believe) enter the school with their arms around each other. Apparently there was a time when that connoted simple camaraderie. Still, my favorite technique in this scene—and I’m pretty sure I have seen Beck employ it, though it may just have been Jon Stewart’s hilarious parody of Beck—is the rhetorical question that’s self-answered by a ludicrous, unsupported assertion. The alphabet is mankind’s greatest invention? On what basis? Language itself would arguably qualify, but there are plenty of non-alphabetic languages around, including the “Chinese ideograms” that Mason derides. (Let’s not even get started on Beck and xenophobia.) And how exactly does one teach kids to read, if not via that horrible-sounding “system of word recognition”? Letter by letter? I’m not sure whether it’s reassuring, depressing, or both to realize that people have apparently been making this sort of inane “argument”—identify ostensible threat, attack nonsensically, trust that very few will bother to parse what you’re actually saying—since well before I was born. At least in Bigger Than Life, such nonsense can be blamed on too much cortisone. We today have no such luxury.